Fireworks at last Monday’s Suwannee BOCC, although after they had already voted to hike to the Suwannee River soon<. 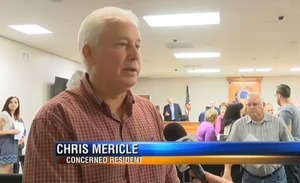 WWALS board member Chris Mericle, who will be their guide, also spoke in the meeting. The recent issuance of certificates by FERC called out the Suwannee River and Suwannee and Hamilton Counties by name, so action by those counties is now even more important. As the search for better energy resources takes shape, natural gas has been a resource that many agencies have relied on. 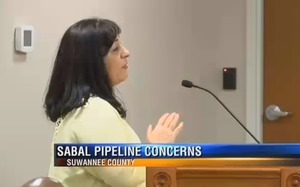 But for the residents in Suwannee County, a natural gas pipeline that would pass through several county properties isn’t the answer. Fifty, ten, or even five years ago natural gas might have made some sense, but solar power is now cheaper, faster to install, and far cleaner and safer. As I’ve written in a series of letters to the Suwannee Commissioners, there are peer-reviewed plans to convert Florida and every other U.S. state to be powered completely by sun, wind, and water by 2050, with most of that within the next decade. Wasting $3 billion of FPL ratepayers’ money and risking the Suwannee River and the Floridan Aquifer while taking easements from property owners only slows down that conversion. 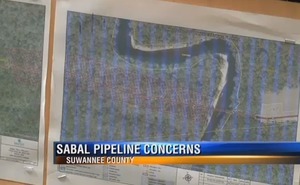 The article describes the proposed pipeline and mentions the upcoming hike to the Suwannee River, and then continues. One cause for concern are the compression stations located in the area. With visible sinkholes near the pipelines path, many are worried that the vibrations will cause more sinkholes to open up and possibly damage properties and home values. The video with the story mistakenly refers to fracking at the compressor stations, but the text story has that fixed. The fracking is intended to be in the Marcellus Shale in Pennsylvania to feed Sabal Trail. But is it OK to frack somebody else’s watershed? Notice the prominent mention of renewable energies. 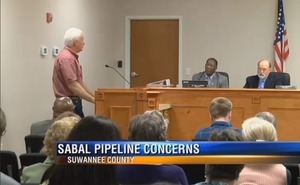 Now if he can just get off of FPL’s talking points and move into the present like Southern Company has, Suwannee County will oppose Sabal Trail and get on with solar power. Southern Company’s subsidiary Georgia Power has already made Georgia the fastest-growing solar market in the U.S., and SO’s subsidiary Gulf Power is building far more solar power in the Florida panhandle than the token solar projects FPL is doing. 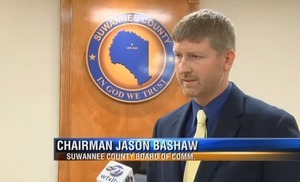 Suwannee County Commissioners don’t “have to” accept risks for their county. They are elected to represent their people, not FPL, and not a pipeline company from Texas. 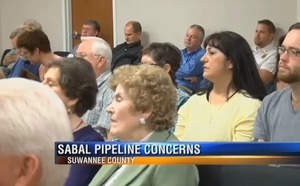 When FERC issued certificates to Sabal Trail and its ugly stepsisters the day after that Suwannee BOCC meeting, it called out Sabal Trail’s horizontal directional drilling (HDD) under the Suwannee River as near a spring and therefore Sabal Trail “will be subject to a site-specific monitoring plan during construction”. Do you trust Spectra Energy, from Houston, Texas, to properly monitor the Suwannee River? And what about after construction? Who will be watching to prevent a blowout like that Spectra pipeline under the Arkansas River last May? The Suwannee County Commissioners are close to standing up for the people of Suwannee County and setting an example for Florida and Georgia. And with such an important task at hand county commissioners want to make sure they get this right. We all hope so. History is watching. Your grandchildren will ask what you did. PS: You are invited to the movie at the Women’s Club in Live Oak Friday evening. And remember to sign the petition. This entry was posted in Aquifer, Pipeline, River and tagged Aquifer, conservation, Duke Energy, Florida, Floridan Aquifer, FPL, north Florida, Paulo Salazar, pipeline, river, Sabal Trail Transmission, south Georgia, Spectra Energy, Suwannee BOCC, Suwannee County, Suwannee River, watershed, WTXL, WWALS, WWALS Watershed Coalition on February 4, 2016 by jsq.